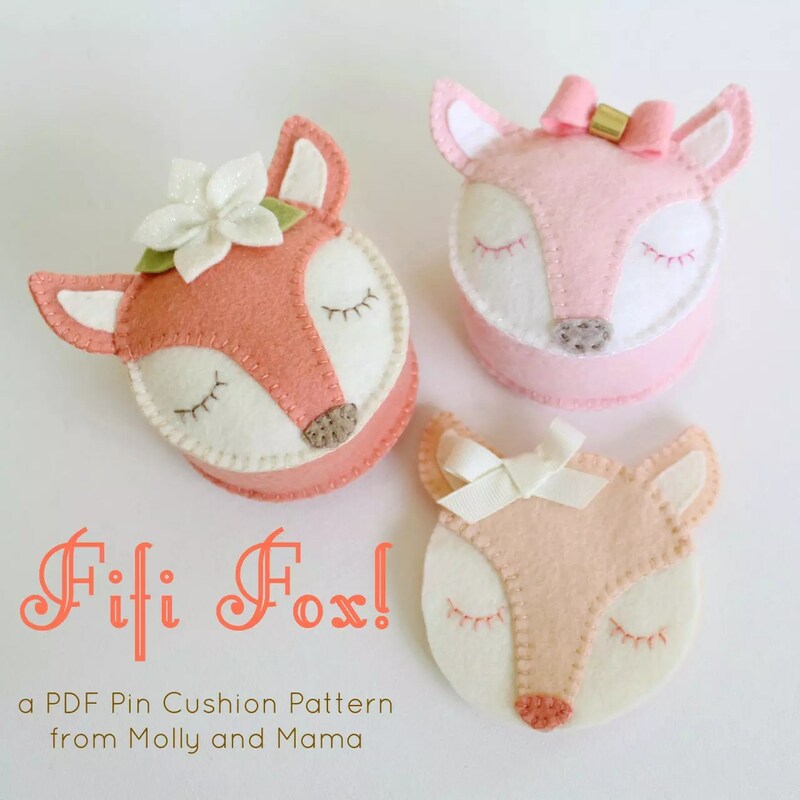 With the Fifi Fox pin cushion pattern just being released, I wanted to share a FREE TUTORIAL for adapting the PDF pattern to create a fox needle book too! Why have only one fox adorning your sewing space, when you can have two? To make this Fifi Fox needle book, you will need to purchase the pattern HERE. Then print out the template, and collect your materials. For this project, you will need all the items listed in the pattern, plus an extra felt circle. However, you will leave out the felt side piece. Cut out all the felt pieces required for the needle book. In fox coloured felt you will need 4 ears, 1 fox face and 1 felt circle. In the paler felt shade, you will need 2 felt circles and 2 inner ears. You will also need 1 felt nose in a darker shade, and 5 flower petals and 2 leaves (if you choose to make a flower for embellishment). Using the instructions in the pattern, stitch the two felt ears and put aside. Next, follow the pattern to blanket stitch the fox face to the top circle. Then add the nose and embroider the eyes. Using two strands of embroidery floss, blanket stitch each ear in place (by attaching it to the fox face as shown below). Do not stitch the space at the top of the head (between the ears) yet. Make a felt sandwich with the fox coloured felt base on the bottom and the other felt circle in the middle, with the completed fox face on the top. Pin the layers together. To join the three layers of the needle book, you will need to create a line of blanket stitching that goes from the top of one ear, across the head, to the top of the other ear. This stitching will hold all the layers of felt together. Be sure to disguise your knot between the layers of felt so it can’t be seen on the back of the needle book. 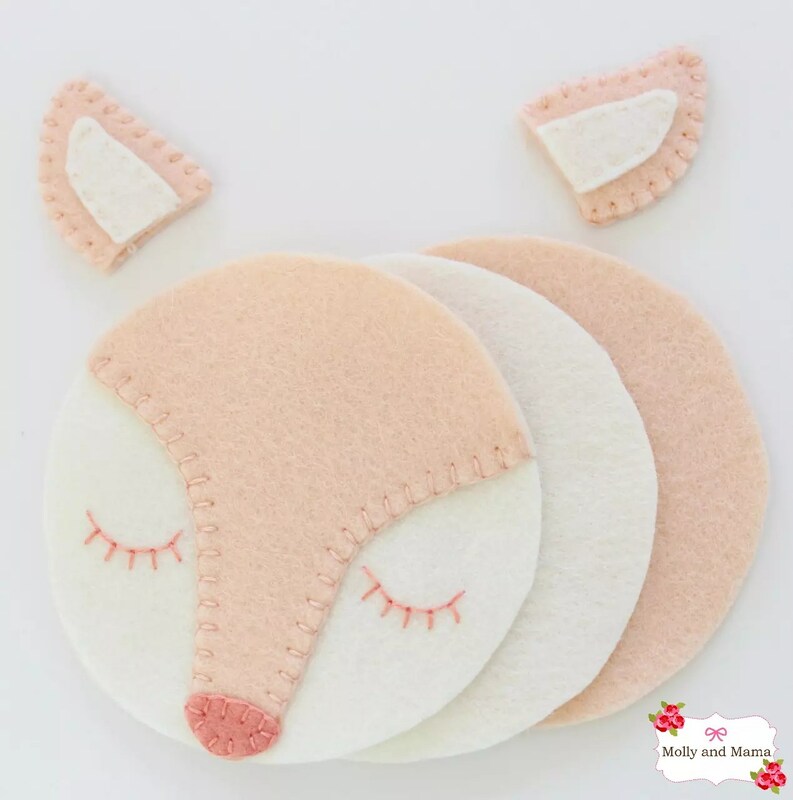 When you’ve stitched everything together, you’ll be able to flip back the fox face and use the centre felt circle to store sewing pins and needles. So cute! You’re almost finished! Sew up a felt flower by following the instructions and using the template in the Fifi Fox pattern. Alternatively, you can create a small bow to stitch to the face instead. Be sure to only attach it to the first felt layer (and not through all three layers in the ‘sandwich’). Use invisible stitches. If you add a bow, be sure to heat seal the ends so they don’t fray. Then you’re all finished! How sweet is that? 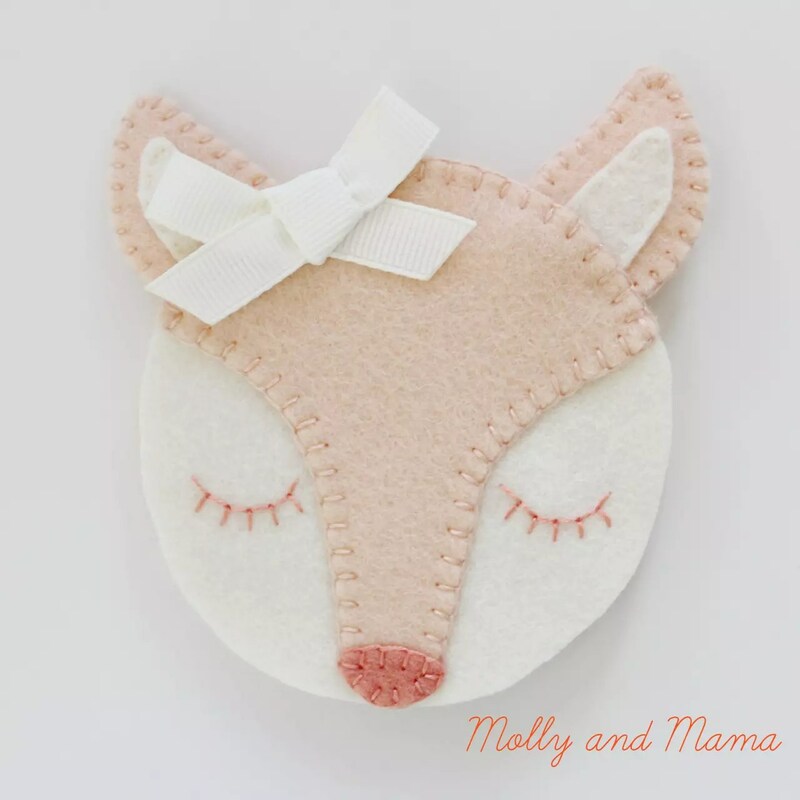 If you get stitching, be sure to share your creations by tagging @MollyandMama and #MollyandMama on Instagram. Or post an image to the Molly and Mama Facebook page wall. I’d love to share them! For more free projects, be sure to visit the TUTORIALS tab. And for more patterns, you’ll find lots in the ETSY STORE. Thanks for being here!